The Money Monster is a situation in search of a movie — and, I’m afraid, it’s a search conducted in vain. The movie’s premise is known to anyone who’s seen the trailer. A blustering cable TV financial maven is taken hostage while doing his show. The gunman, who takes over a studio at the fictional FNN network, straps a bomb-containing vest to TV loud mouth Lee Gates before voicing what the movie seems to view as a legitimate grievance. The aggrieved gunman lost his life savings because he acted on a supposedly solid stock tip Gates gave his gullible audience. When the stock tanks, the gunman decides that the system — i.e., just about everything — is rigged. He wants answers. Well, here’s one. A movie that’s trying, among other things, to expose a lack of credibility in our brazen 24/7 media ought to be far more credible itself. The Money Monster flirts with thriller and satirical elements without providing enough of either, and despite the presence of appealing stars George Clooney (as Gates) and Julia Roberts (as Patty Fenn, his producer), the movie short sells character development. Gates is a self-congratulatory on-air clown whose show traffics in noisy gimmicks. Patty is all business, the savvy woman who presides over the TV circus in which Gates performs. Clooney gives Gates the brash presence of an unashamed showman; Gates likes to don a gold top hat and open his business report with a song-and-dance number. Roberts’ character speaks to Gates through an earpiece while he’s being held hostage. She tries to keep him from making a fatal mistake. The gunman (Jack O’Connell) becomes the movie’s slightly demented everyman, a $14-and-hour delivery guy who has a girlfriend and a kid on the way. He sees no future for himself. He doesn’t want his $60,000 investment back; he wants answers. It’s not always wise to judge a movie by its predecessors, but The Money Monster evokes memories of far better entertainments — Network, Dog Day Afternoon and The Big Short among them. Director Jodie Foster can’t fuse the material into anything substantial. 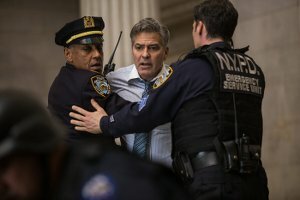 The Money Monster seldom rises far enough over-the-top to qualify as wildly inventive satire, and its thriller elements (a hostage is held, the police arrive, etc.) are routine. The movie’s less-than-suspenseful plot hinges on complicated business shenanigans involving Ibis Clear Capital, a financial company that claims that its rocketing stock — the one Gates boldly recommended — tanked because of a computer glitch, thereby losing a total of $800 million for its stockholders. As bona fide movie stars, Clooney and Roberts keep The Money Monster watchable, but in this case, seeing definitely isn’t believing. You may not be able to take your eyes off Clooney and Roberts, but their magnetism mostly is wasted on a screenplay that dares to take place in real time, but seldom bothers to make what happens during that time seem believably real.